Work has now started on leveling the site for the 53 'affordable' residences approved on 29th February by the planning authority. 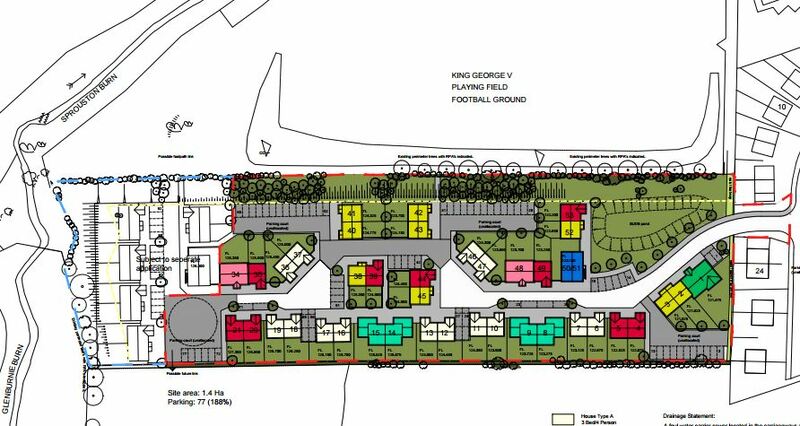 It is a joint venture between applicant Queensberry Properties Ltd, who will construct the houses, and the Eildon Housing Association (EHA) which will manage 49 of the units and rent them out at “social housing rent levels”. I acknowledge receipt of your email dated 8 December and sent to Enquiries at Eildon HA. The development has just commenced in late November. It is for 53No houses and flats, is an18 month contract and completion is due in sections between March-June 2018. Details of properties can be had from Eildon HA website at the link below – see Future sites which will give you details of property sizes being built. This link will only be available until Monday (12th December) when we launch our new website. The new website will contain the same information but a different link. I will send you a link next week when Website launched. Information on ‘How to Apply’ is contained in the link below. Eildon HA operate a choice based lettings system with all properties advertised each week – new build and voids – in the Southern Reporter under Borders Choice Homes advert. To apply for properties you need to be registered with Borders Choice Homes and details are contained in the link in how to register. New build properties are usually advertised in the Southern around 6-8 weeks before becoming available. The Sergeants Park properties will be advertised, assuming no delays to project, sometime early 2018. I hope the above is sufficient for your purposes at this stage but should you require any further information please contact myself.